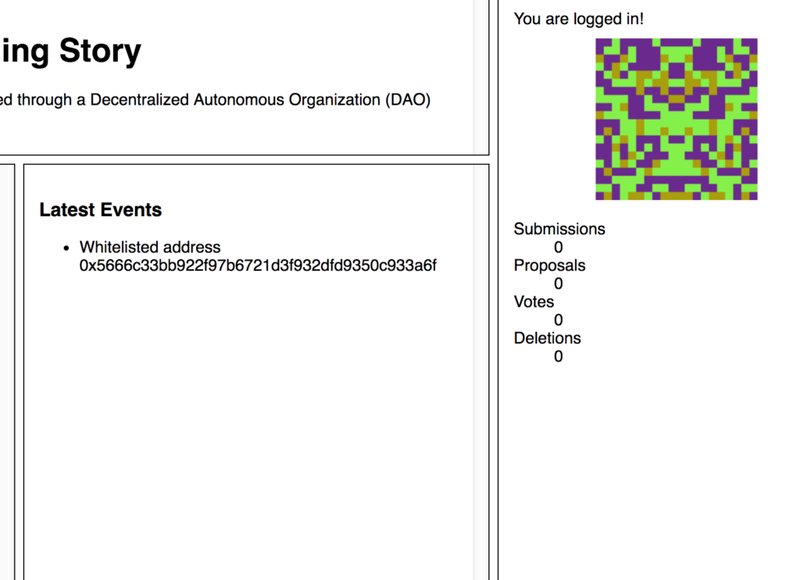 In part 6 of this tutorial series on building DApps with Ethereum, we took the DAO towards completion by adding voting, blacklisting/unblacklisting, and dividend distribution and withdrawal, while throwing in some additional helper functions for good measure. In this tutorial, we’ll build a web interface for interacting with our story, as we otherwise can’t count on any user engagement. So this is the final part of our story before we launch it into the wild. Right now as we deploy our token and DAO, they sit on the blockchain but don’t interact. To test what we’ve built, we need to manually transfer token ownership and balance to the DAO, which can be tedious during testing. Here’s what this code does. First, you’ll notice it’s promise-based. It’s full of then calls. This is because we depend on a function returning some data before we call the next one. All contract calls are promise-based, meaning they don’t return data immediately because Truffle needs to ask the node for information, so a promise to return data at a future time is made. We force the code to wait for this data by using then and providing all then calls with callback functions which get called with this result when it’s finally given. then, ignore the returned result — we just wanted to know when it’s done — and finally transfer ownership of the token to the DAO’s address, returning the data but not discarding it. Note: this is a really really basic skeleton, just to demo integration. Please don’t rely on this being the final product! It’s possible that you’re missing the dist folder in the web3 folder. The software is still beta, so minor slip-ups are still possible there. To get around this and install web3 with the dist folder, run npm install ethereum/web3.js --save. Notice how asking for the balance of our active (MetaMasked) account yields 0, while asking for balance of one of our private blockchain accounts yields 100 ether (in my case it’s Ganache, so all accounts are initialized with 100 ether). assume its return values will be twofold: first error, then result. For more information about promises, callbacks and all that async jazz, see this post. Let’s populate the right-most column about account information with real data. When the user is not signed into their MetaMask extension, the account list will be empty. 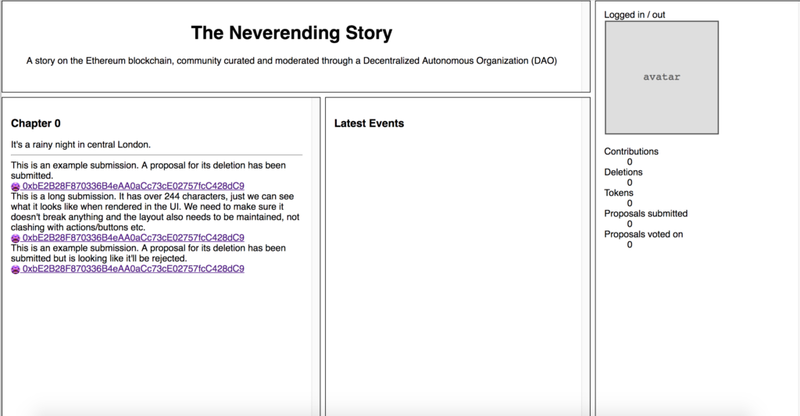 When MetaMask isn’t even installed, the provider will be empty (undefined). When they are signed into MetaMask, the provider will be available and offer account info and interaction with the connected Ethereum node (live or Ganache or something else). 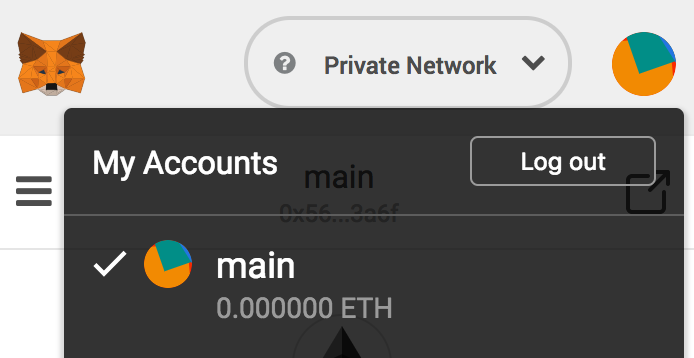 Tip: for testing, you can log out of MetaMask by clicking on your avatar icon in the top right and then selecting Log Out. If the UI doesn’t look like it does in the screenshot below, you might need to activate the Beta UI by opening the menu and clicking on “Try Beta”. 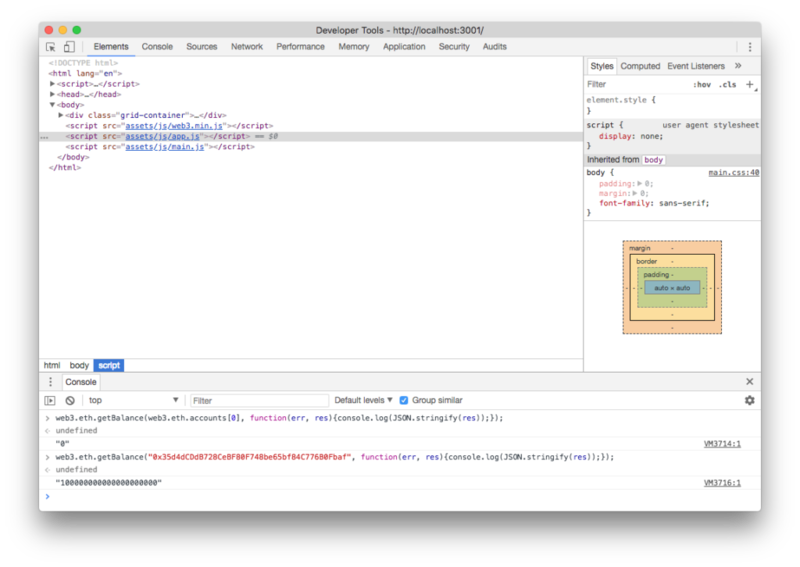 The currentProvider of the web3 object is set (i.e. there’s a web3 client present in the website). There’s a non-zero number of accounts available, i.e. an account is available for use via this web3 provider. In other words, we’re logged in to at least one account. If these conditions together evaluate to true, the setLoggedIn function makes the “Logged out” message invisible, and the “Logged In” message visible. All this has the added advantage of being able to use any other web3 provider as well. If a MetaMask alternative shows up eventually, it’ll be instantly compatible with this code because we’re not explicitly expecting MetaMask anywhere. Because each private key to an Ethereum wallet is unique, it can be used to generate a unique image. This is where colorful avatars like the ones you see in MetaMask’s upper right corner or when using MyEtherWallet come from, though Mist, MyEtherWallet and MetaMask all use different approaches. Let’s generate one for our logged-in user and display it. In main.js, we kickstart the function. Now if we refresh the page when logged in to MetaMask, we should see our generated avatar icon. Now let’s output some of the account balance information. We have a bunch of read-only functions at our disposal that we developed exclusively for this purpose. So let’s query the blockchain and ask it for some info. To do that, we need to call a smart contract function via the following steps. Get the ABI of the contracts whose functions we’re calling. The ABI contains function signatures, so our JS code knows how to call them. Learn more about ABI here. Note that the above screenshot shows the abbreviated insertion, collapsed by my code editor (Microsoft Visual Code). If you look at line numbers, you’ll notice that the ABI of the token is 400 lines of code, and the ABI of the DAO is another 1000, so pasting that into this article would make no sense. We call upon each contract with the address given to us by Truffle and create an instance for each — token and story respectively. Then, we simply call the functions (asynchronously as before). The console gives us two zeroes because the account in MetaMask has 0 tokens, and because there are 0 submissions in the story for now. Finally, we can populate the user’s profile data with the info we have available. You’ll notice we used promises when fetching the data, even though our functions are currently just mock functions: they return flat data immediately. This is because each of those functions will need a different amount of time to fetch the data we asked it to fetch, so we’ll await their completion before populating the User object and then passing it on into the render function which updates the info on the screen. If you’re unfamiliar with JS promises and would like to learn more, see this post. For now, all our functions are mocks; we’ll need to do some writes before there’s something to read. But first we’ll need to be ready to notice those writes happening! In order to be able to follow events emitted by the contract, we need to listen for them — as otherwise we’ve put all those emit statements into the code for nothing. The middle section of the mock UI we built is meant to hold those events. 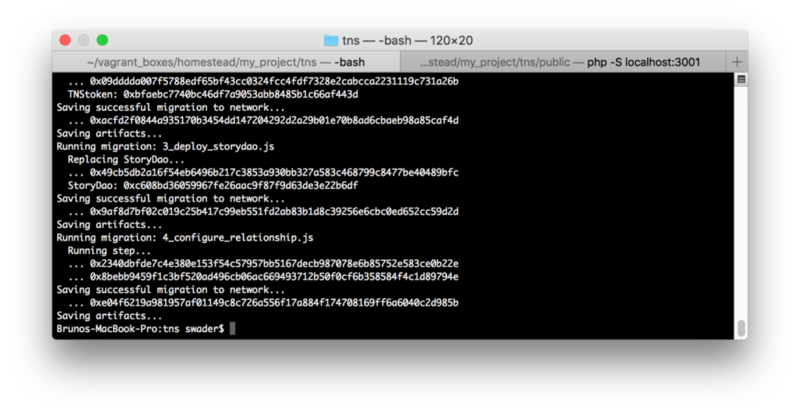 Here we call the Whitelisted function on the story instance of our StoryDao contract, and pass a callback into it. This callback is automatically called whenever this given event is fired. So when a user gets whitelisted, the code will automatically log to the console the output of that event. // eventResult contains list of events! Note: put the above into a separate section at the bottom of your JS file, one dedicated to events. Here, we use the get function which lets us define the block range from which to fetch events. We use 0 to latest, meaning we can fetch all events of this type, ever. But this has the added problem of clashing with the watching method above. The watching method outputs the last block’s event, and the get method outputs all of them. We need a way to make the JS ignore double events. Don’t write those you already fetched from history. We’ll do that further down, but for now, let’s deal with whitelisting. Finally, let’s get to some write operations. The first and simplest one is getting whitelisted. Remember, to get whitelisted, an account needs to send at least 0.01 ether to the DAO’s address. You’ll get this address on deployment. If your Ganache/PoA chain restarted in between parts of this course, that’s okay, simply re-run the migrations with truffle migrate --reset and you’ll get the new addresses for both the token and the DAO. In my case, the address of the DAO is 0x729400828808bc907f68d9ffdeb317c23d2034d5 and my token is at 0x3134bcded93e810e1025ee814e87eff252cff422. 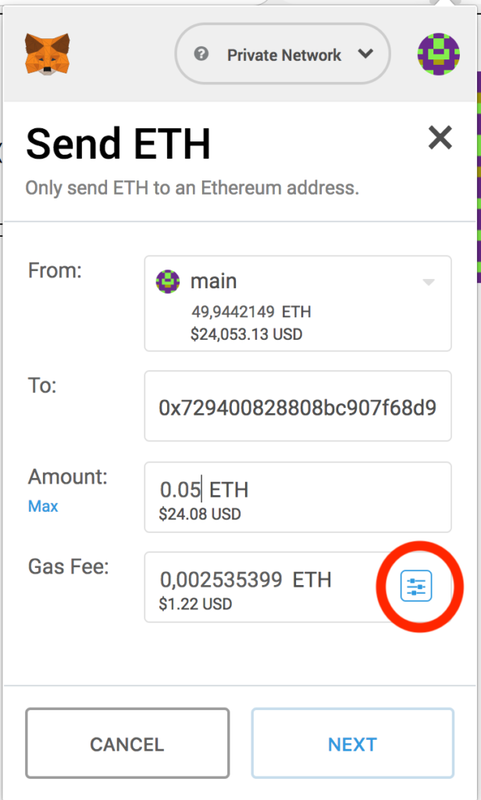 With everything above set up, let’s try sending an amount of ether to the DAO address. Let’s try it with 0.05 ether just for fun, so we can see if the DAO gives us the extra calculated tokens, too, for overpaying. 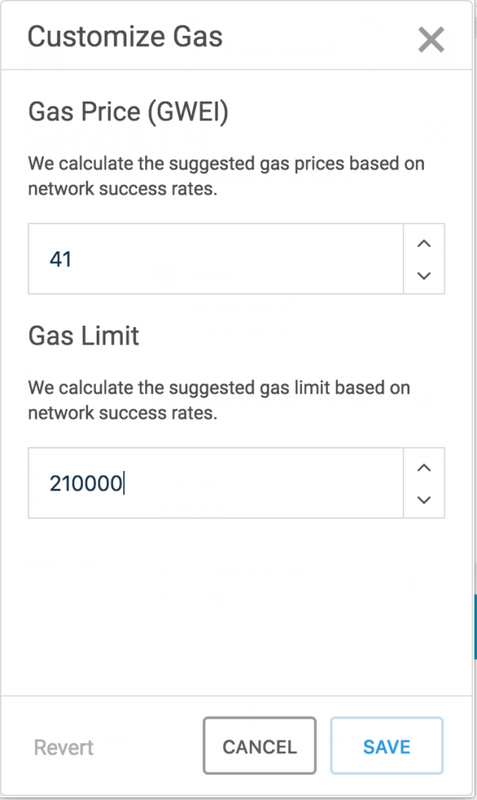 Note: don’t forget to customize the gas amount — just slap another zero on top of the 21000 limit — using the icon marked red. Why is this necessary? Because the function that gets triggered by a simple ether send (the fallback function) executes additional logic which goes beyond 21000, which is enough for simple sends. So we need to up the limit. Don’t worry: anything over this limit is instantly refunded. For a primer on how gas works, see here. After the transaction confirms (you’ll see this in MetaMask as “confirmed”), we can check the token amount in our MetaMask account. We’ll need to add our custom token to MetaMask first so it can track them. 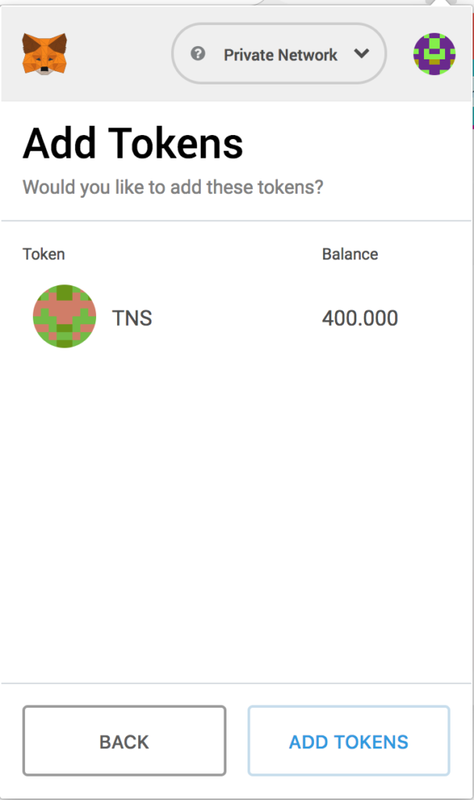 As per the animation below, the process is as follows: select the MetaMask menu, scroll down to Add Tokens, select Custom Token, paste in the address of the token given to you by Truffle on migration, click Next, see if the balance is fine, and then select Add Tokens. For 0.05 eth we should have 400k tokens, and we do. What about the event, though? Were we notified of this whitelisting? Let’s look in the console. Indeed, the full dataset is there — the address which emitted the event, the block number and hash in which this was mined, and so on. Among all this is the args object, which tells us the event data: addr is the address being whitelisted, and status is whether it was added to the whitelist or removed from it. Success! Wow, events got complicated fast, huh? Not to worry, we’ll clarify. The highestBlock variable will remember the latest block fetched from history. We create an instance of our event and attach two listeners to it. One is get, which gets all events from history and remembers the latest block. The other is watch, which watches for events “live” and triggers when a new one appears in the most recent block. The watcher only triggers if the block that just came in is bigger than the block we have remembered as highest, making sure that only the new events get appended to the list of events. We also added a printEvent function to make things easier; we can re-use it for other event types too! If we test this now, indeed, we get it nicely printed out. You can also manually check the whitelist and all other public parameters of the StoryDAO by opening it in MyEtherWallet and calling its whitelist function. You’ll notice that if we check the account from which we just sent the whitelisting amount we’ll get a true back, indicating that this account really exists in the whitelist mapping. Use this same function menu to experiment with other functions before adding them to the web UI. We added a very simple textarea through which users can submit new entries. Let’s do the JS part now. First, let’s get ready to accept this event by adding a new one and modifying our printEvent function. We can also refactor the whole event section a bit to make it more reusable. Now all we need to do to add a brand new event is instantiate it, and then define a case for it. Next, let’s make it possible to make a submission. Here we add an event listener to our submission form which, once submitted, first rejects everything if the user isn’t logged in, then grabs the content and converts it to hex format (which is what we need to store values as bytes). Lastly, it creates a transaction by calling the createSubmission function and providing two params: the text of the entry, and the false flag (meaning, not an image). 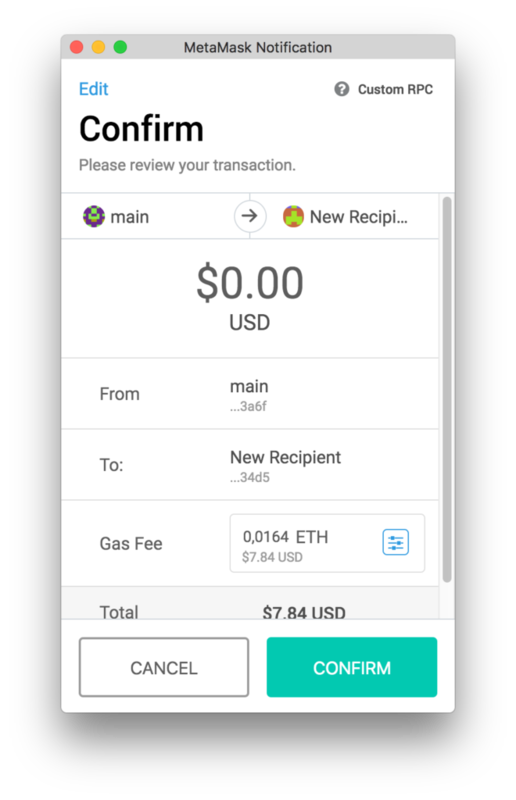 The third argument is the transaction settings: value means how much ether to send, and gas means how much of a gas limit you want to default to. This can be changed in the client (MetaMask) manually, but it’s a good starting point to make sure we don’t run into a limit. The final argument is the callback function which we’re already used to by now, and this callback will call a refresh function which loads all the submissions of the story. Currently, this refresh function only loads story hashes and puts them into the console so we can check that everything works. Note: ether amount is 0 because the first entry is free. Further entries will need ether added to them. We’ll leave that dynamic calculation up to you for homework. Tip: there’s a calculateSubmissionFee function in our DAO for this very purpose. The changes are marked with // CHANGE: the first one lets us set the default account from which to execute transactions. This will probably be made default in a future version of Web3. The second one refreshes the submissions on page load, so we get a fully loaded story when the site opens. If you try to submit an entry now, MetaMask should open as soon as you click Submit and ask you to confirm submission. You should also see the event printed out in the events section. The console should echo out the hash of this new entry. We roll through all the submissions, get their hashes, fetch each one, and output it on the screen. If the submitter is the same as the logged-in user, “you” is printed instead of the address. Let’s add another entry to test. In this part, we developed the beginnings of a basic front end for our DApp. prevent the rendering of the vote and delete buttons unless the user has at least 1 token, etc. let people submit and render Markdown! order events by time (block number), not by type! use a proper JS framework like VueJS to get some reusability out of your project and to have better structured code. In the next and final part, we’ll focus on deploying our project to the live internet. Stay tuned!